Hi everyone!!! We got our first round of cookies in over the weekend, so my daughter was busy sorting, labeling, and delivering! 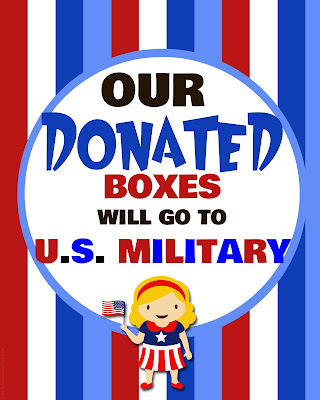 I wanted to share a thank you card that I created for the people who donated boxes to the military. These would be good to have on hand at cookie booths too! They're formatted for Avery 5163 labels, but would be fine on regular paper as well. Enjoy! And here's a sign for cookie booths! These are fantastic! thank you so much! Your donation to the military ones are also great. 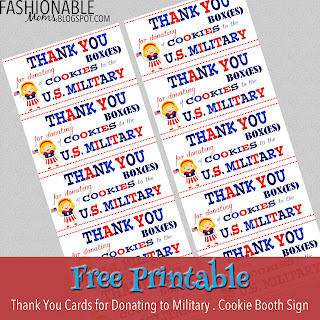 Do you have a free printable that we can fill in for other "hometown heroes" donation groups? Thank you so much for these printables! I'm a new Daisy co-leader and I've been searching Pinterest for helpful downloads. Last-Minute Valentine Idea - Non-Candy!